This hotel is located in the eastern part of central Prague, a few minutes from the vibrant city life. Close to the hotel there is a bus and a tram station. At the Aron hotel you enjoy comfortable en-suite rooms at great-value rates in a convenient location with easy access to the very heart of the Golden City. An excellent breakfast buffet is available every morning and is included in the room rate. The helpful and friendly staff will make sure that you spend a pleasant stay in this marvellous city. 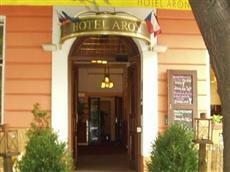 Aron in Prague has 49 rooms.